Simon Pegg in a rom-com? Many would be surprised and perhaps even be skeptical about him playing a romantic but he did pull it off very well, playing a character with a bit more depth than the usual one-dimensional prince charmings in most rom-coms, even though he’s not the main protagonist here. Directed by Ben Palmer (The Inbetweeners) and written by Tess Morris (feature film debutant, apparently), the story focuses on Nancy Patterson (Lake Bell), a very negative 34-year-old single woman who’s desperate to be in a new relationship but has been unwilling to put herself out there and take a chance. Lake Bell (In a World…) is absolutely spot on with her portrayal as a confidently miserable person who’s awkward, judgmental and also heartbreaking in moments that call for it. On the way back to her hometown for her parents’ 40th anniversary party, Nancy meets a pretty and self-motivated 24-year-old girl named Jessica (Ophelia Lovibond), who’s on the way to a blind date. After overhearing Nancy’s pitiful phone conversation, Jessica leaves a self-improvement book for her in attempt to encourage her to be more hopeful. While Nancy is chasing Jessica at the train station to refuse her gift, she is stopped by a charming 40-year-old stranger who mistakes her as his blind date as she’s carrying Jessica’s book. Due to glimpses of things in common, Nancy decides to finally take a chance and play along as Jessica. And there it begins the adventurous blind-blind date that could turn into real romance, all in one single evening. While Lake Bell is the star of the film, it wouldn’t complete without the brilliant comedic chemistry with Simon Pegg. From his popular films like Hot Fuzz (2007) and The World’s End (2013), Pegg has proved to be great at talking fast while being funny but for Man Up, it required him to also be forcefully charming and unpretentiously moving, which he’s delivered quite well. 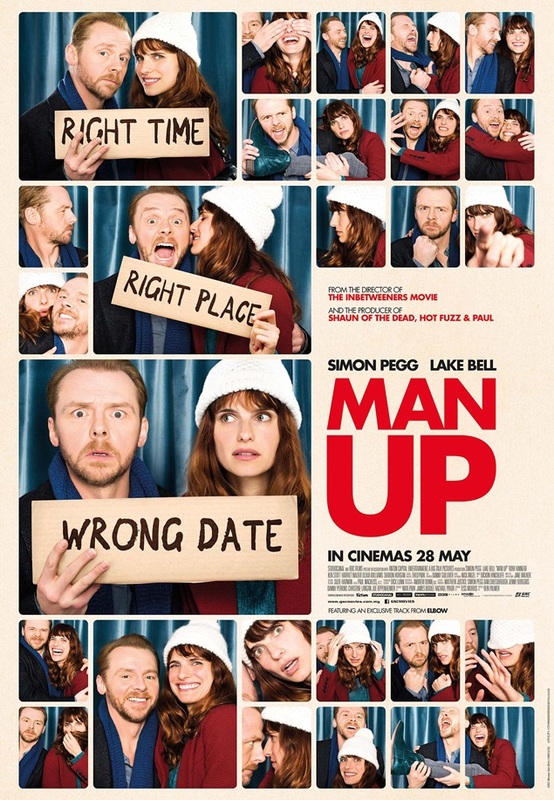 Man Up is one of the few examples of how a rom-com can make good use of the genre’s cliches and still turn out good. The film is witty, fun, heartwarming, not cheesy, brutally honest, and I believe it can be highly relatable and encouraging to many over-30s who has the similar problem, wondering if they should really put themselves out there and take a chance. Malaysia censorship: There are loads of F-bombs, kissing and even underage intoxication but nothing’s cut or even muted at all, which is awesome! Second opinion: My girlfriend enjoyed it as well, saying that it’s nice, funny and probably the best rom-com she’s seen recently. Verdict: The best rom-com I’ve seen in a while. It’s a chick flick for the more mature audience (around late 20s to 40s) that even the guys may enjoy and have a great laugh with as well.